Pacon Fadeless Bulletin Board Paper helps you add style and creativity to your classroom. This paper roll is 4-feet high by 50-feet long, giving you plenty of paper to cover your bulletin board time and time again. 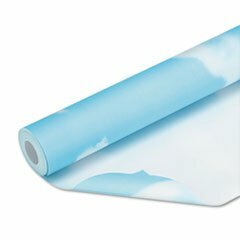 The Clouds design on this paper features fluffy white clouds on a light blue sky background. This recyclable paper is ultra fade-resistant and is acid-free for long-lasting displays. Pacon Fadeless Bulletin Board Paper is perfect for backgrounds, displays, table skirting, party decorations, and more. Pacon Fadeless Paper allows you to let your imagination shine!